Nipsey Hussle was an avid LA sports fan. We look back at his life and his impact on the sports world. He stood tall. Silent. Focused. Despite being surrounded by people—including another local hip-hop legend in YG—he stood out amongst the others. There was a lifetime's worth of living behind his eyes. As he once said, "I sleep light, but I dream big, I tend to talk less because I've seen sh--." This was the first time I met Nipsey Hussle. I suppose it's ironic that I would be introduced to this local icon in my home away from, within the dark familiar corridors of Staples Center, the same halls that will host his public memorial service on Thursday. 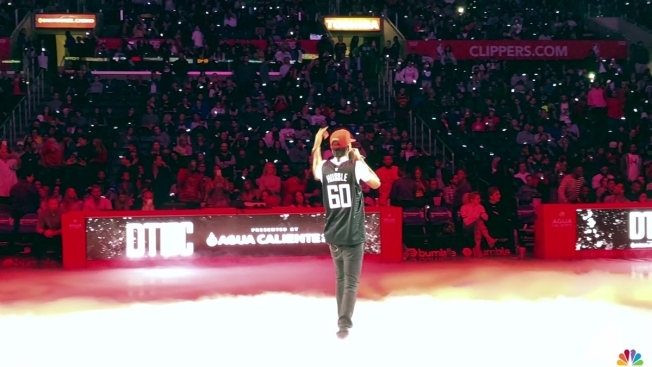 Hussle was performing songs from his debut studio album, Victory Lap, at halftime of a Los Angeles Clippers game. An album that would see him go from a zealous underdog to a Grammy nominated hip-hop sensation. Nipsey Hussle first came on my radar in 2010, following the release of his Marathon mixtape. There was a track that featured a guest appearance by psych-pop duo MGMT. As a casual hip-hop fan, I loved the blend of rap and soothing beats of "Electric Feel." At the time, Hussle was an aspiring rapper that had yet to ascend the heights of other West Coast based artists like NWA, Snoop Dogg, Kendrick Lamar, and 2Pac. Flash forward to the winter of 2017, and a friend and I were driving to the Forum to watch Jay Z's 4:44 tour. On the way, we listened to a podcast and Hussle was the guest. He was promoting Victory Lap, which would be released in February of 2018. As soon as the album hit all the music-streaming services, I listened to it from front to back for a week straight. It was unlike any other hip-hop album I had heard before. It was rough and raw, but inspirational and encouraging. Hussle didn't just rap about the typical clichés of drugs, violence, money, and women, but he instead stressed the importance of hard work, dedication, and motivation. Through his music, Hussle preached about the value in giving back to those less fortunate. He wanted the world to know that anyone, from any background, could rise to the top, but once you'd reached the pinnacle of fame and success, what you did with it, was much more worthwhile. So needless to say, when I saw him in the hallway at Staples Center less than a month later, I was extremely excited to meet him. "Call me Nip," he said shaking my hand after I awkwardly called him "Mr. Hussle." Minutes later, as I followed him on to the court, I realized I wasn't the only one excited to see him. An arena that is normally half-empty during intermission was suddenly stocked full of fans, each with their phones out, anxious to catch a glimpse of this rising star. Even the high-powered fans courtside stood up out of their seats and watched, waiting til after the game to stop by the Chairman's room for a drink. Boxer Floyd Mayweather Jr., NFL star JuJu Smith-Schuster, and actors Adam Devine and Billy Crystal all stayed to see Hussle's performance. Hussle was no stranger to Staples Center. One could argue it was his second home. 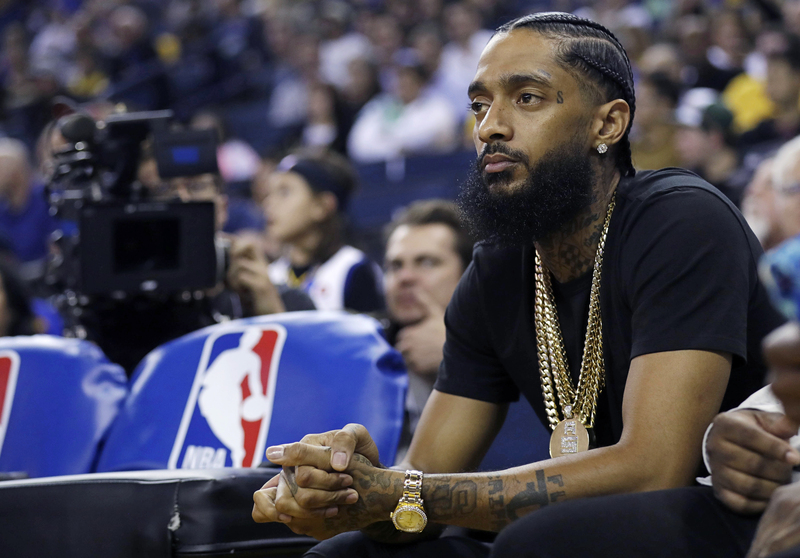 Whether he hopped up on stage and did a guest performance during a concert, sat in the seats during the Grammys, or was courtside for a basketball game, Hussle was always here. He was a diehard sports fan and loved his hometown teams. His influence on the Southern California sports landscape reached beyond the scope of a famous fan. Hussle participated in charity basketball games, refurbished courts in his Crenshaw neighborhood, and even purchased sneakers for an entire elementary school in Hyde Park. "Growing up as a kid, I was looking for somebody—not to give me anything—but somebody that cared," he told the Los Angeles Times in an interview in 2018. "Someone that was creating the potential for change and that had an agenda outside of their own self interests." Hussle became that somebody, and his relationship with LA based sports; its athletes, and its teams, is only part of the indelible legacy he leaves behind in the community. Hussle was born Ermias Asghedom, and was raised in South Los Angeles. He grew up going to Dodgers and Lakers games, and as he gained fame and notoriety, only the proximity of his seats changed, not his love for our local teams. Hussle's music has been played at Dodger Stadium, Staples Center, and the Coliseum for years. He regularly rocked a Dodgers hat, and donned a Lakers or Dodgers jersey in his music videos. He sat courtside with his longtime girlfriend, Lauren London, hobnobbed with Denzel Washington, and challenged players to three-point shooting contests (he lost every time). His impact on Southern California sports and the athletes that started from here was never more evident than the days that followed his sudden and tragic death last Sunday while standing outside the Marathon Clothing store he owned. Less than 24 hours later, Hussle's name was written on the sneakers of NBA players throughout the league. MLB players changed their walk-up music to his hit songs, local sports teams held moments of silence in his honor, and the tributes only poured in from there. LeBron James sent out multiple messages on Twitter, posted countless videos of him singing his songs in his Instagram stories, wore a Nipsey Hussle t-shirt to a Lakers game, and then broke down when discussing his passing after the game. Close friend and former NBA MVP Russell Westbrook paid homage to his close friend by showing up to a game against the Lakers wearing a "Crenshaw" t-shirt, and then became the second player in NBA history to have at least 20 points, 20 rebounds, and 20 assists in a game. After the contest, he dedicated his performance to Hussle. "That wasn't for me man, that was for my bro, that was for Nipsey," Westbrook said during his postgame interview on the court. "20, plus 20, plus 20. They know what that means. That's for my bro. Rest in Peace, Nipsey." Reigning NBA MVP and Bellflower native, James Harden, poured in 36 points and 10 assists two days after Hussle's death and he too, dedicated his performance to his late friend. "He was powerful. Not just to a certain dynamic, or a certain city, but to the world," said Harden after a game in Los Angeles last week. "He was a leader. It's been sad. Not only for myself, but a lot of people are affected by it, and it just doesn't seem real." It's been over a week since the world lost Nipsey Hussle, and for the city of Los Angeles, we share the same sentiment as Harden, it still doesn't feel real, and maybe it never will, but one thing is for certain, his legacy will live on forever. 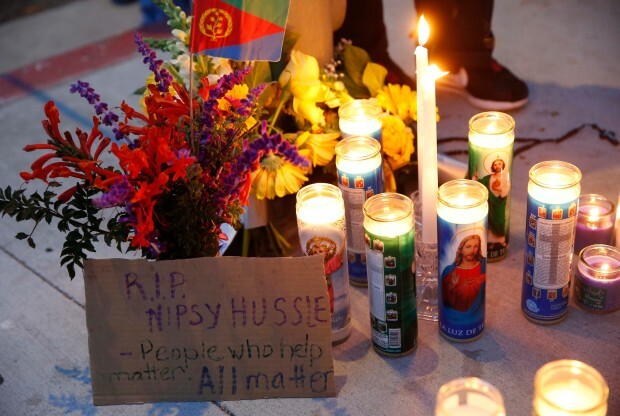 Nipsey Hussle's memorial service will take place Thursday morning, April 11, 2019 at Staples Center. If you can not see the embedded images, please click "View on NBC Southern California" at the bottom of this page.